Steve loves to sail big and small boats. He enjoys medieval re-enacting and both combat and target archery in the Society for Creative Anachronism. Member of the Odd Bodkins archery company. His latest passion is home brewing beer. He crews and is the photographer on Hot Air Balloons for Up and Away Ballooning. Member Santa Rosa Photography Society. Deals for Atomic Casino Parties. He was very involved in volunteering with his children's clubs and sports. 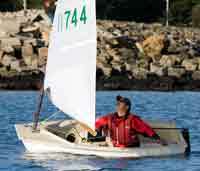 Member Richmond Yacht and former Junior Sailing Camp and High School Sailing Director.